Anger boiled over at a town hall meeting Tuesday night as Hays County residents decried a company's plan to pump and sell millions of gallons of groundwater. The heated dispute foreshadows more to come in a growing state that's running out of water. WIMBERLEY — Hundreds of people packed a community center Tuesday night to demand that state Rep. Jason Isaac, R-Dripping Springs, stop a commercial groundwater-pumping project in Hays County. Not that there is much he can do to stop it. 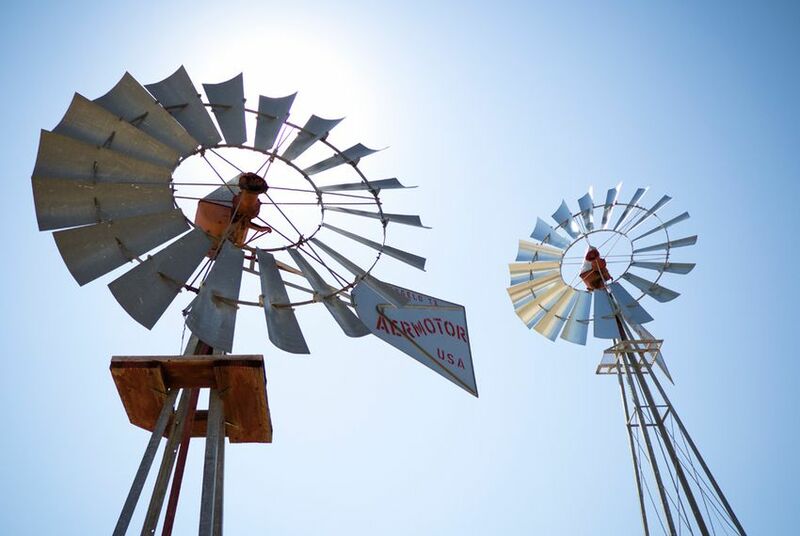 But their wrath underscored an issue likely to flare up repeatedly across the state as water supplies dwindle and the population keeps growing: Texas' approach to managing groundwater is increasingly incompatible with the demographics and growth patterns of the state. And possible solutions are hard to find amid bruising local politics, deep-pocketed business interests and small-government-minded legislators. If the town hall meeting called by Isaac is any indication, the fights will not be gentle. The community center was decorated with signs that read "EP go home!!!" and the cheeky, "They pumped paradise and put up a subdivision." Public officials and an angry crowd used the meeting to shame those who would profit from the Hays County deal. "We don't want you here. We want you to leave," said Hays County Commissioner Will Conley, pointing directly at Tim Throckmorton. Throckmorton owns Houston-based Electro Purification, or EP, which is planning to pump more than 5 million gallons of water each day from the Trinity Aquifer in western Hays County, where no groundwater regulator has any authority. That's far more water than has ever been pumped in the region, and area hydrologists fear it could have devastating effects on the wells most nearby residents rely on. Conley's verbal assault drew cheers and a standing ovation from the crowd. And a presentation from Clark Wilson, who is building a community of homes and hopes to buy EP's water, drew jeers from the audience. "Apparently, none of y'all live in my homes," he said defiantly, while people laughed at pictures of his planned neighborhood complete with green lawns, a lake and a neighborhood swimming pool. Throckmorton, too, looked embattled. "Our customers have come to us and asked us, can we come up with a solution to their problem" of a water shortage, he told the audience. "And at this point, we're not sure we can." Hydrologists who spoke before Throckmorton acknowledged that wells near EP's may go dry because of the company's pumping. "It's been a political awakening for us," said Dan Pickens, a marketing executive who has lived in Rolling Oaks for 20 years. "What's the value of a home with no water?" Pickens and his neighbors say their wells are already unreliable in the midst of severe drought, and they deserve protection. But on the flip side, some say, landowners also have the right to sell the water beneath their land for a profit. And that's exactly what two families in the area have decided to do, using EP as the marketer. "That is always the irony of property rights proponents, just to be blunt," said Russ Johnson, who represented one of the landowners who is selling their water to EP. "What really makes people bat crazy, and correctly so, is ... not everybody can share." The solutions offered so far are myriad, but limited. Several landowners say they'll fight attempts to send the water pipeline across their property. And Isaac has proposed legislation that would give the Texas Water Development Board some say over wells in unregulated areas like where EP is drilling. But that's unlikely to happen, said Brian Sledge, a water lawyer who lobbies for the Texas Water Conservation Association, one of the largest water interest organizations in the state. For decades, the Legislature has left local groundwater districts to decide who can pump water and how much they can pump, not the state. "I can't think of a better system," he said. It's more likely that Isaac will be able to extend the boundaries of one of the neighboring groundwater conservation districts to include the area where EP is drilling. And Republican state Sen. Donna Campbell, whose district also includes the region, told The Texas Tribune on Tuesday that she would support such legislation. Still, that isn't a silver bullet. If EP has already started producing water, no district could retroactively cancel its ability to do so. If the district tries to limit how much water EP can pump, it's likely to end up in court. That means the district needs to have ample financial resources — and the Legislature is unlikely to have the appetite for giving local regulators any more power to tax or charge groundwater production fees. A more practical solution, said lawyer Russ Johnson, is to start accepting the fact that some people's wells will be impacted. EP has offered a "mitigation plan" of sorts, which could involve paying well owners to lower their pumps if the project causes their water supplies to dry up. And the city of Buda, which hopes to buy 20 percent of the EP water, has promised to be a part of that. But how much that will cost is impossible to know, because even EP acknowledges that the impacts of pumping are still unknown. "The effect of the pumping can only be known by long-term pumping and monitoring of the aquifer response," the company said in documents prepared for Buda. That's a wild card for Buda, which may have to budget more for the project if mitigation gets expensive, said the city's mayor, Todd Ruge. "I just want a chance to show them that we are a good neighbor," he said of those who oppose the project in Rolling Oaks and elsewhere. More than 1,500 properties and seven utilities that rely on groundwater are located near EP's well fields, local officials say. Donald Lee, director of the Texas Conference of Urban Counties, said there's a much larger problem that needs to be addressed: growth occurring outside the jurisdiction of cities. The new subdivisions that EP wants to sell water to, for instance, aren't under the jurisdiction of Hays County or any nearby cities. So no one has any real authority to make sure growth proceeds prudently. Giving counties more authority to regulate growth would be a big help, Lee said, but it's not clear if that will happen anytime soon. "Growth isn't unsustainable if we don't screw it up," he said. "But right now, there's pressure to screw it up."